I took a bunch of small pics of my storage today. I did not take pics of my room overall because it's still a mess in places where I'm still doing some organizing. So I took a LOT of pics since they were all of specific areas. I'm going to post a few each day or else it would be way too long for one post. The first one is my Stampin' Up cardstock. 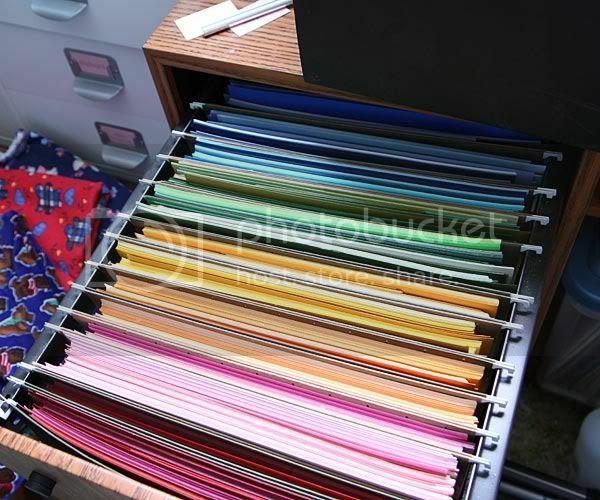 I have 3 desktop hanging file boxes which I tied together with some wide ribbon. 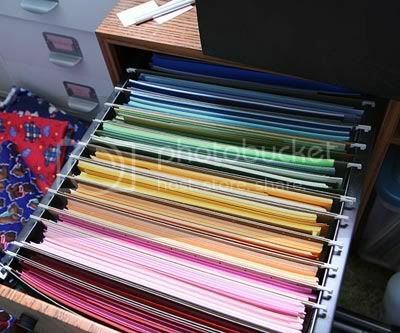 I put hanging files in them and then regular folders in the hanging files with my SU cardstock sorted by color. 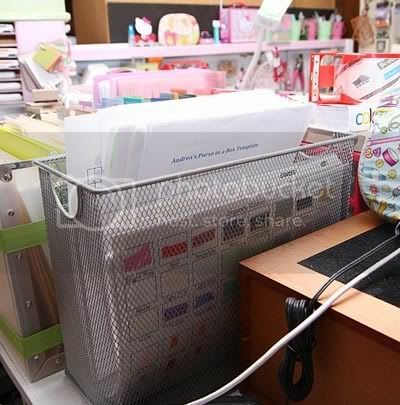 At the front are also some other brands of white cardstock. In the very back I had some extra room so I have my PTI colored cardstock, extra shimmery white cardstock, and some textured cardstock I got somewhere. I *think* it's from Hero Arts. This one is my Bazzill cardstock. 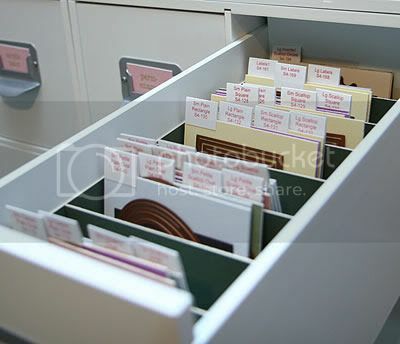 This is one drawer of a 2-drawer filing cabinet. The other drawer is also completely full. This top drawer is all Bazzill-the bottom drawer has Bazzill plus Lasting Impressions patterned paper. I have a serious problem with paper. 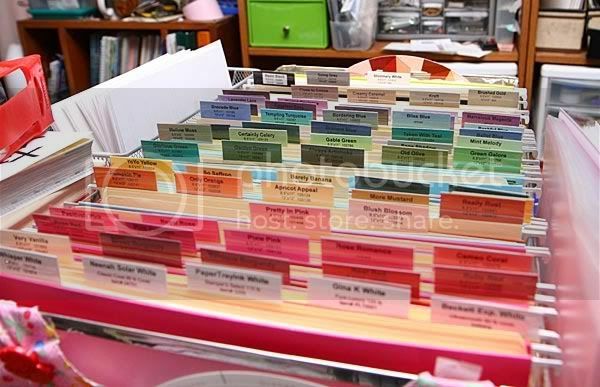 This is a smaller tabletop file holder where I keep charts (color charts, ribbon charts, etc) as well as printouts for different projects and also some sketches. This is my newest way of storing my nestabilities (other than the long rectangles which I will show in another post). I've tried several others so I hope I like this method. It's one of my jetmax cube drawers-I made a divider thing out of mat board so that they would stand upright and then each set of nestabilities is on a piece of mat board with magnets on it. I made labels for each one so I could quickly find the ones I want. This is my Cricut Expression. I keep it on this wooden printer stand I got from Lakeside Collection. I keep papers (like ones I've used for testing or sizing) and small mats (for my personal Cricut) in the open sections. In one drawer I keep my extra blades, cricut markers, etc. In the other is all of my manuals for my various craft toys. My 12 x 12 mats are stored underneath. This cute cover was given to me by Kim O. I'm going to make a different one someday but for now this one works perfectly to keep the dust out of it. This isn't exactly storage. Well, not for craft supplies anyway. 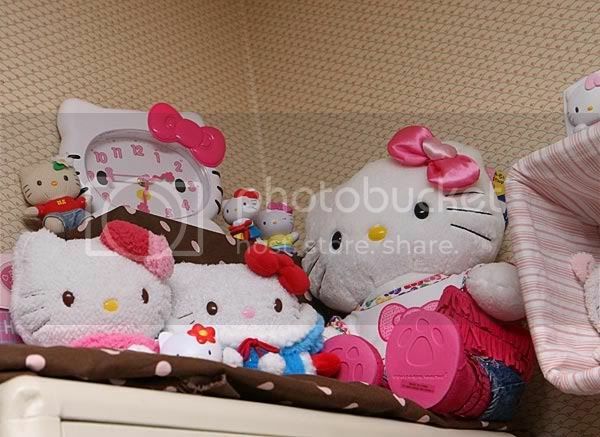 This is my Hello Kitty collection (most of it). The big one is from Build a Bear Workshop and the two small ones are from Inside Scoop. The clock is from Target and the little ones are all past McDonald's Happy Meal toys. It's all sitting on a metal cabinet that is filled with fabric. And yes I hate the wallpaper in this room but for now it's staying. I don't even want to think about moving all of my stuff out to paint. Last of all (for tonight). This shelf is actually a basket that I screwed to the wall. It used to hold my Hello Kitty clock-radio but I got the Target wall clock instead and will give the clock-radio to my daughter, who will at least be able to get more use out of the radio and alarm clock part of it (both of which I never used). So I put these two plush kitties in there. I got them both from Target. 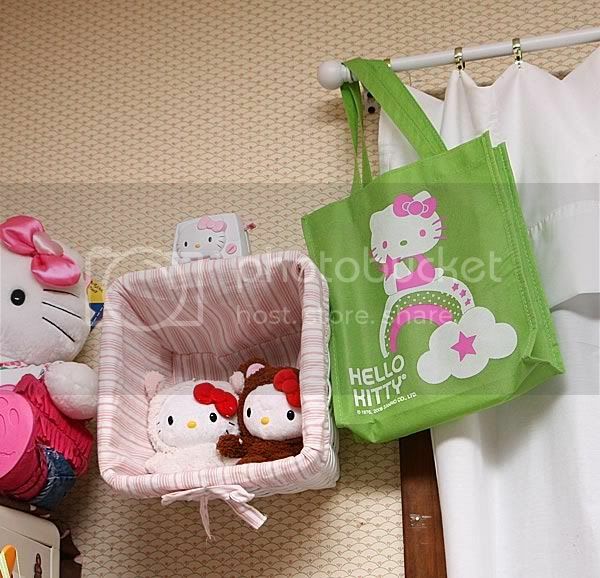 To the right is a bag from the Target dollar spot. I have one hanging on either end of my curtain rod and I keep empty Nestability packages and other things like that in them. Stuff I don't need out but I want to save for shims or using on projects. Stay tuned-I'll post more in the next few days. 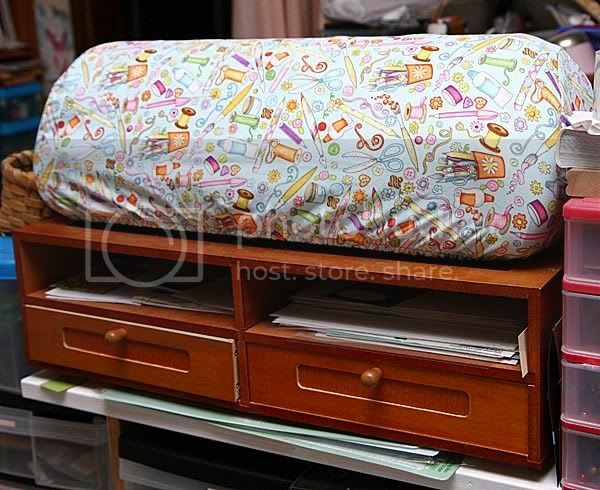 Great storage ideas. Very organized looking.